This easy and highly addictive recipe is perfect for Hanukkah or anytime you want an easy vegetable-based appetizer. 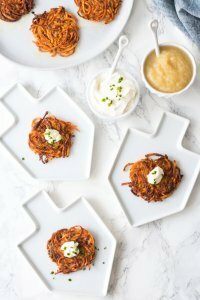 For a fun-twist on the traditional latke recipe, I’m using sweet potatoes instead of russet potatoes. Your family will love this not-so-traditional sweet and spiralized spin on latkes. Prepare your flax egg. In a small measuring cup whisk together the ground flaxseed and water. Set aside and allow it to “gel” for at least 5 minutes while you prepare the latkes. You will add the flax egg at the very end. This will help to bind your latkes together. Spiralize the sweet potato. Cut off either end of your peeled sweet potato to make a flat surface. Place in your spiralizer and use the blade that produces the thinnest noodles. I use blade D on my Inspiralizer. Spiralize the entire sweet potato and place the sweet potato noodles in a large mixing bowl. Use kitchen sheers to cut them into shorter strands. I usually make ten cuts. Spiralize the shallot. Cut off either end of the shallot to make a flat surface. Spiralize using the blade that produces the thinnest noodles. I use blade D on my Inspiralizer. Spiralize the entire shallot. Add the shallots to the sweet potatoes in your mixing bowl. Make the latke mixture. Add the garbanzo bean flour, arrowroot powder, salt, garlic powder and pepper to the mixing bowl. Toss together until everything is evenly distributed. Add the flax egg mixture and mix well again. Make sure the flax egg is evenly coating everything throughout the mixture. Pan fry the latkes. In a large saute pan, heat 2 tablespoons of extra virgin olive oil on medium heat. Once the oil is hot you can start to make the latkes. Use a ¼ cup measuring scoop and pack the latke mixture into it. Be sure to get all the noodles inside the scoop and press firmly. Carefully flip the measuring scoop to drop the latke onto the saute pan. My pan fit four latkes at a time. Once the latkes have cooked for a minute or two use a spatula and gently press down on the latke to flatten it slightly. Continue to gently flatten and shape the latkes as they cook. Cook for 4-6 minutes on each side. Flip once the edges are golden brown and crispy looking. Watch closely at the end to be sure you do not burn them. Once the first batch is complete, transfer to a plate or tray lined with paper towels to absorb excess oil. Continue to pan fry the next batch of latkes. Add another tablespoon or two of olive oil to your pan before each new batch. Serve your latkes warm with a dollop of vegan sour cream (homemade or store-bought) and/or applesauce. I like to also garnish with diced fresh chives. Note: If you do not have a spiralizer, you could also use a food processor or hand grater to grate the sweet potato and shallot. You could finely dice the shallot. I have not tested these methods with this particular recipe but this is how traditional latkes are prepared. I find the spiralizer to be quick, simple and easy to clean. The cook time is 30 minutes assuming you make 3 separate batches. If you have a larger pan, use multiple pans or use a two burner griddle you could cook more at once and it would only take about ten minutes to cook (5 minutes per side). If you would like to lighten this recipe you can use less oil and lightly pan fry with just a teaspoon or two of olive oil per batch.